Ballymena United's goalscoring hero Ryan Mayse shields the ball from Institute centre-back Caoimhin Bonner. Ballymena United emphatically bounced back from their weekend loss in stunning style, against a shell shocked Institute. David Jeffrey’s side, who moved to just six points behind leaders Linfield with six games remaining, were in outstanding form and blew the visitors away inside the opening quarter and also saw keeper Ross Glendinning keep out Aaron Jarvis’ early penalty. In the first half, striking duo Adam Lecky and two goal hero Ryan Mayse were unplayable at times and their link-up play destroyed ’Stute. A defensive mistake Dean Curry after 40 seconds should have resulted in the home side taking the lead. The ’Stute skipper’s header back to keeper Marty Gallagher was far too short and fell to Andrew McGrory, but he took too many touches and missed the chance, however the loose ball fell to Mayse and his side footed strike from six yards was blocked by Caoimhin Bonner. After that early scare ’Stute when straight up the other end and were given a penalty on five minutes. United centre-back Jonathan Addis handled inside the box, referee Andrew Davey, rightfully pointed to the spot, but Jarvis’ resulting effort from 12 yards was saved by Glenndinning, the keeper diving to his left to keep the strike out. In a crazy opening seven minutes, United were inches away from scoring, as Lecky’s shot on the turn from 10 yards, flashed just wide. United did take the lead on 13 minutes in stunning fashion as Glendinning’s punt down field was flicked on by Lecky to Mayse, he chested the ball down on the edge of the ’Stute box, before firing high into the top left hand corner, giving Gallagher no chance. Seven minutes later Jarvis, went close to cancelling out his penalty miss, but his curling 25 yard shot, flew just over. Moments later the Lecky and Mayse combo nearly worked a treat again, but this time Gallagher did well to keep out the front man’s strike. Amazingly the double act were at it again on 24 minutes as Braidmen added a second; Lecky’s pass found Mayse inside the box and the ex-Dungannon Swifts man, saw his shot sail over Gallagher. This game was over as a contest two minutes later as United added a third, this time Mayse’ low cross found Albert Watson and the big centre-back fired home his first goal since returning to the Showgrounds. United deservedly added a fourth on 37 minutes as Tony Kane’s left wing corner found an unmarked Leroy Millar, who gleefully nodded home at the back post. 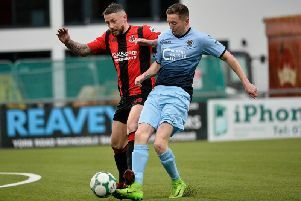 To their credit ’Stute pulled a goal back in super fashion on 55 minutes, Colm McLaughlin feed Paul Smith, the striker cut in from the left before curling the ball home form 25 yards. United added a fifth on 75 minutes as Mayse’s fantastic right wing curling cross to the back post, found an unmarked Lecky, who side footed home from close range. United substitute Shane McGinty scored against his old club on 86 minutes, as his shot deflected off the unfortunate Shaun Leppard and gave Gallagher no chance. Ballymena United: Glendinning, Quigley, Ervin (Burns 83), Watson; Kane, Addis, Mayse, McGrory, Winchester (McGinty 80), Lecky (Shevlin 80), Millar. Institute: Gallagher, Bonner, Leppard, D Curry; R Morrow, Jarvis, J Morrow (Moorehead 66), McIntyre (S Curry HT), McLaughlin; Smith, McCready (McLaughlin 79).